At my dental office in Lewisburg, we are asked this question a lot. There are some injuries that absolutely require you to head straight to the hospital. However, the majority of dental problems should be seen by a dentist. But how do you know which is which? Basically, the type of injury dictates where you should head to get treated. Before you decide where you should go to get treated, it’s important to know which type of injury is usually seen at a hospital and which is seen by your Lewisburg dentist. 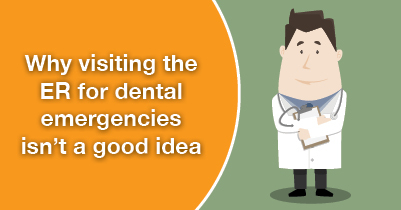 These dental problems are absolutely appropriate to have treated in the emergency room. In fact, we highly recommend heading to the hospital as soon as you can or calling 911 if one of these injuries is present. At the hospital, you’ll be evaluated and treated. When you’re released, the doctor may recommend that you see your dentist as a follow up. This appointment is extremely important, making sure your smile is returned to health and strength. These types of dental emergencies are not life-threatening, but that doesn’t make the need for immediate care any less important. If you’re experiencing one of these dental problems, it’s crucial that you not ignore it and seek attention from your dentist as soon as possible. At my Lewisburg dental office, we will absolutely help you through any dental emergency. We’re also big supporters of prevention and one key way to prevent a dental problem from occurring in the first place is to brush and floss everyday, keep up with your regular appointments at our office, wear a mouthguard while playing sports, and watching what you eat (easy on the popcorn!). There are many of us who are unhappy with the smile we were born with. But luckily, there’s the wonderful world of cosmetic dentistry to help transform smiles. At my Lewisburg dental office, you’ll have plenty of cosmetic options to choose from, but today, we’d like to talk about one of the most popular choices: dental veneers. Choosing veneers to get the smile of your dreams is an option that could eliminate the need for multiple treatments. For example, instead of braces, bonding, and whitening, veneers can achieve the same results in fewer visits. The goal of dental veneers is to create the smile of your dreams and the process is a perfect mix of science and art. Your dentist in Lewisburg will match the veneers to your current or ideal shade of white, shape them to compliment your other teeth, and apply them artfully for a natural-looking transformation. So if veneers can do so much, the process should be complicated, right? Not at all! Your individual plan will begin with a consultation, at which you’ll talk about your goals and your desired results. Once a plan is established, your first appointment may include prepping, or removing a thin layer of the surface of each tooth to allow space for the wafer-thin veneer shell. If needed, temporary veneers will be fitted while the permanent ones are being constructed in a lab. When finished, the permanent veneers are adhered, or bonded, to your teeth, resulting in a total smile transformation. If you think veneers are right for you, or if you’d like to talk about the best way to get the smile you’ve always wanted, give my dental office in Lewisburg a call today. We’ll schedule you a consultation and work together to discuss the best treatment for you.